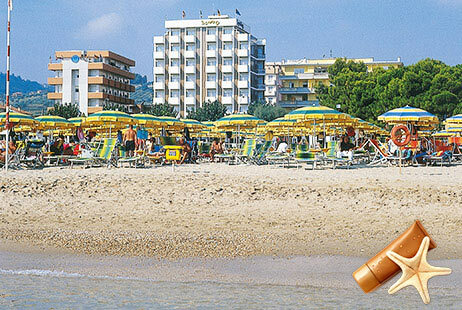 The Hotel Sporting, Alba Adriatica Hotel is just a short stroll from the sandy beachfront of Abruzzo, the most beautiful of the Adriatic Coast. Sporting can find a friendly ambience, friendliness, kindness and friendship in a whole staff, ideal for a holiday with your family in complete tranquility. Thanks to a completely modern and air-conditioned, your stay at Alba Adriatica is dedicated to wellness. At your disposal you will find many facilities such as Wi-Fi available in all rooms, minibar room, outdoor swimming pools, to bring you a real moment of relaxation and fun evening organized along the edge, indoor pool with whirlpool, Sporting Village Beach, ample parking, covered and fenced, garage. Large swimming pool on the beach of more than 150 square meters, with Jacuzzi; playground on grass; entertainment for adults and children every evening. Everyday dishes of the Italian tradition. Pasta and fish are guaranteed every day, buffets and special menus for children. Private beach service with cabins, parasols and deck chairs. Clean the sand each morning. Disabled access. Bar. Swimming pool and playground. Wellness room with Technogym equipment and machinery. Tennis Court at mt. 500 service bicycles helpful along the seaside promenade. Shows for adults and children. Water aerobics, spinning, pilates, dance groups. Mini club, junior club and inflatable games for children. At Hotel Sporting Alba Adriatica always stay connected! Wi-fi available in all rooms.